Enough for a whole class at a low price! Get enough for your whole class or group for one low price! 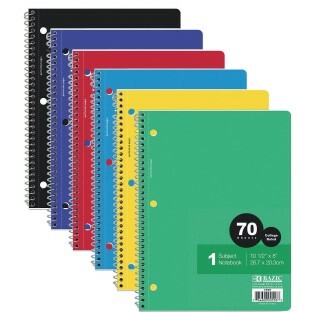 Study or write in style with this Bazic 1-subject college ruled spiral notebook. Comes in assorted vibrant colors and comes in a convenient set of 24, providing you with plenty to last through the school year. Each notebook is a single subject with 70 pages to take notes in. It's also available in wide ruled (OC1167). The notebook has a handy wire spiral binding that makes it simple to turn through the pages as needed. They are perforated for easy removal and include 3 holes to easily fit 3-ring binders. College ruled sometimes called medium ruled paper has 9⁄32 in (7.1 mm) spacing between horizontal lines, with a vertical margin drawn about 1 1⁄4 inches (32 mm) from the left-hand edge of the page.